There were several church’s in the community where we lived. The denominations included Baptist, Methodist, Church of God and Church of Christ. During the summer months some of the church’s would go together an plan a tent revival. A farmer would let them use one of his big fields and the men would put up a big brown tent. They would bring in folding chairs, sting lights for the meeting and donate song books. There would be many people that would go to a tent revival that would never go to the church house. I suppose it didn’t seems as threatening to them. It was interesting to see how other church’s worshiped and as a kid I just observed. Some people would “get in the Spirit”, raise their hands and talk loud. Some older men would “shout” loud their praise and others would just wave their hands. Our church worshiped in a much quieter manner, but I learned to appreciate how others praise God. 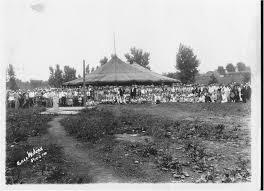 The person doing the preaching was called an evangelist and he usually traveled to many town’s in WV to preach in tents. Their message was usually directed to Christians to improve their relationship with God and to unsaved to accept Jesus as their personal Savior. People would go to the alter during the invitation and have prayer with the minister. This was an old fashioned way to worship, but I remember it as being very interesting.